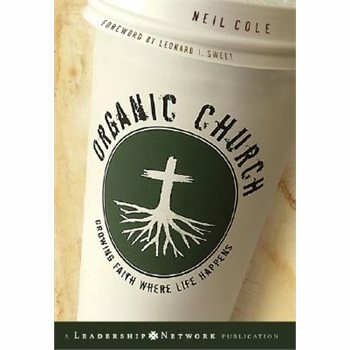 Neil Cole believes “that church should happen wherever life happens” (24). As founder of the Awakening Chapels network and Church Multiplication Associates which claims 700 churches in 32 states and 23 nations, Cole is a leader in what is most-often referred to as the house church movement. He dislikes the “house church” designation—citing the fact that many of the churches in his movement meet in parking lots and bars not houses and the connotations “house church” carries of disillusioned and disgruntled defectors from the mainstream church—preferring instead to call them “organic churches” (22). This brief essay will explore some of the key theoretical and methodological proposals found in Cole’s most widely read book, Organic Church: Growing Faith Where Life Happens (2005) and offer a critical insights. of a true church that he learned in seminary (believers who gather regularly, believing themselves to be a church, with qualified elders, practicing the two sacraments and holding a set of doctrines) to be good qualities for a church, but lacking something critical, namely, Jesus! Consequently, Cole and his movement define the church Christocentrically as “the presence of Jesus among His people called out as a spiritual family to pursue His mission on this planet” (53). In such an environment, all Christians are empowered as priests and thus free to conduct the sacraments, evangelize and start new churches. Unlike ecclesiologies developed “from above” Cole’s doctrine flows directly from his work, providing a compelling illustration of Martin Kahler’s oft-repeated adage that declares mission to be the mother of theology. Throughout Organic Church, Cole moves back and forth between speaking of the Kingdom and speaking of the church, leaving the reader unclear on the relationship and distinction. In a chapter that stresses the centrality and benefits of Life Transformation Groups of “two or three” who “meet weekly to challenge one another to live an authentic spiritual life,” he refers to this as simultaneously the “basic unit of Kingdom life” and the “basic unit of Church life” (27, 99). Cole most explicitly draws on metaphors of the church as the (zombie, ie. ailing and ugly) bride of Christ and Christ’s body, but he frequently also implicitly presents believers as Christ’s army, storming the gates of hell and existing in the midst of a “great epic battle between good and evil” (216). The organic/agrarian parables of Jesus serve as a chief source for Cole’s reflection on the nature of the Kingdom and what this ought to mean for the church. From Jesus’ teaching on the Sower and the soils, Cole draws an important conclusion: “To plant the Kingdom and see it grow and bear fruit, two things are absolutely necessary: good seed and good soil” (65). While the good seed is simply the “pure” Word of God, good soil must be sought. Cole’s favorite personal proverb for this search is repeated several times: “Bad people make good soil—there’s a lot of fertilizer in their lives” (72). Relatedly, he suggests, “if you want to win this world to Christ, you are going to have to sit in the smoking section” (xxvii). In addition to the morally compromised, Cole suggests that some of the best places to find good soil are among the poor, the young, spiritual searchers (including occultists and New Agers), the uneducated and powerless, the insignificant, and the discriminated against (72-73). The lives of these “good soil” people, Cole suggests, are ready for the gospel. Besides targeting “good soil,” Cole asserts the need for the church to “regain the lost art of wiping the dust (bad soil) off our feet” (71). Rather than spending time and energy on those who are resistant to gospel, it should be focused on those who are receptive and will be able to reproduce. Two other parables of Jesus contribute principles to Cole’s vision. First, he deduces from Mark 4:26-29, in which the farmer plants, goes about his business sleeping and waking and the seed sprouts inexplicably on its own, the conclusion that the kingdom grows spontaneously, mysteriously and without human understanding or control. As a result, he concludes that anyone can do this fairly simple work and that energy and resources ought to be poured into planting (the gospel) and (eventually) harvesting, not growing (churches). From the parable of the mustard seed (Mark 4:30-32) Cole reasons that “the growth of the kingdom must start at the smallest levels,” which—as mentioned above—he identifies as a group of two or three. If we can not reproduce a group of two or three, he suggests, we will not be able to reproduce groups of 10 or 200. Chapter twelve, titled “The How-to of Spreading the Epidemic,” offers what Cole calls “Jesus’ Plan to Spread the Kingdom” (173). Each element of the plan fits the acronym POP, the first of which is the practice of prayer to the Lord of the harvest for workers (ala Luke 10:2; Matt. 10:38). In searching for a fertile pocket of people, look for a strong sense of community and social cohesiveness...Jesus’ plan is for us to identify a pocket of people who do not have a vital Kingdom witness. Then we enter into relationship with those people. We inject the Kingdom virus right into the darkness, and a church is born there from the changed lives. If they are not receptive (which happens frequently), we simply wipe the dust (bad soil) off our feed and move on to the next pocket of people (177). Third, the power of presence for the work is fundamental. Indeed, one successful evangelist, when asked for the secret to helping so many come to Christ, said simply: “Two words: show up” (179). Importantly, Cole suggests, when believers are present, so is the very power which Jesus declared had been given to him—all authority in heaven and on earth. The fourth principle of the strategy is to seek a person of peace, someone who will be receptive to the message of peace. When such a person is found, workers are to “stay there and reach his or her entire household (oikos)” (181). Finally, Cole suggest that “when a pocket of people receive your message of peace via a person of peace, it will rest upon them, and they become the church”—a people of purpose (184-185). The purpose, according to Cole is participation in God’s mission of salvation, and these organic churches “learn how to reach their friends from the start and don’t know any better than to follow Jesus and expect Him to save their family, friends, and ultimately nations” (185). In recent decades, missionary thinkers have called for a prioritization of missiology over ecclesiology, stressing in diverse ways the belief that the church is secondary to the missio dei whose focus is the world. While The Church for Others, published by the WCC 1967, pulled attention away from the church as traditionally conceived so that Christians could move toward social action in the world, evangelicals who have joined the missional movement have not followed this tack. Instead, many have responded to mission-first thinking by reimagining the church in whatever way is most conducive to a mission focused on reaching “the lost.” The church, for them, has become merely instrumental to mission, and any form of church that facilitates the mission (generally conceived as conversion of individuals) will do. There is an admirable radicalism to Cole’s application of the Protestant (and New Testament) theme of the priesthood of all believers. Clearly, for Cole, all believers (new or otherwise) are authorized as priests and missionaries. Thus, in organic churches baptisms are typically performed by the one who evangelized the new convert. The newly baptized, having opened a door to a fresh social network (oikos) may very well proceed to plant their own church. Cole boasts in this fact, noting that within his movement, churches have been planted by not only new converts but also “former gang members, child molesters, murderers, prostitutes and pimps” (147). The risk of Cole’s vision is that salvation become emptied of content and reduced to the necessity of seeking the salvation of others. It would seem that the most important property of high-bar disciples is that they reproduce disciples, who reproduce disciples. Like a pyramid scheme, Cole is at risk of reducing the Christian gospel to the good news of recruitment, and the Christian life to nothing more than seeking to see others become Christians. It is true that Cole speaks of the regular practices of confession and Scripture immersion typical in organic churches, and of miraculous healings and moments of divine guidance, but all of these seem to orbit around the primary ambition of winning more of the lost. While this view is fraught with the danger of omitting the centrality of dimensions of the Christian life such as worship, spiritual formation, and service to others and replacing these with a missions-only notion of discipleship, there is something quite right and refreshing about highlighting the call to mission as a basic and inextricable dimension of the gospel’s appeal. In contrast to common distortions that have presented a commodified gospel that offers benefits such as eternal bliss or peace in life, Cole makes it clear that the gospel is not only an offer, but also a demand, that becoming a Christian is not simply a matter of receiving forgiveness, but of receiving a commissioning. In conclusion, it is significant to note the tone of excitement and anticipation that pervades Cole’s writing. Indeed, Cole believes that the Spirit is today bringing back to the church’s awareness the plan of Jesus (decentralized, organic churches) that had somehow been lost in history (142). Inspired by this conviction and miracles of various types, his hopes take eschatological shape as the possibility of fulfillment of the Great Commission within a generation. Whether his primitivism and optimism might be judged as naïveté and historical arrogance, it is clear that Cole, and others like him, embody a radical alternative to the typical American Christian life. For the growing numbers of those becoming bored and disillusioned by church curricula which pass for discipleship and social clubs which pass for church, Organic Church offers a compelling vision of an adventurous, overtly spiritual, Christian life lived among those Jesus seemed to favor. Cole, Neil. Organic Church: Growing Faith Where Life Happens. 1st ed. Jossey-Bass, 2005. David Bosch offers this translation of Kähler’s Schriften zur Christologie und Mission, published in 1908 in his Transforming Mission, 1971, p.190. According to Cole, the benefits of groups of “two or three” over larger groups include stronger community, stronger accountability, stronger confidentiality, more flexibility, better communication, unity of direction, and stronger leadership (100-102).